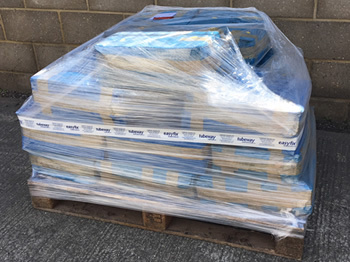 For deliveries of any volume, Tubeway have a range of courier and pallet services to suit. 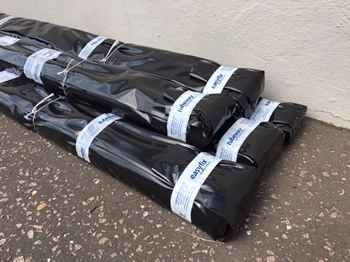 These cover any UK postcode, for small or large, light or heavy consignments. Generally a Proof of Delivery will be obtained, although in some circumstances goods can be left in a safe place at an unattended location. Most of our plastic extrusions are supplied in long lengths, so they are bundled securely together, the ends reinforced with paper, then encased in a polysleeve or cardboard tube. Many of our products are suitable for packing in cartons, which are then sent loose or can be palleted, particularly when numerous and heavy. Typically, each parcel will not exceed 20kg, and will be packed to withstand robust handling. Our parcel and pallet carriers use UK postcodes to find your locations, determine the services they can offer and the cost. 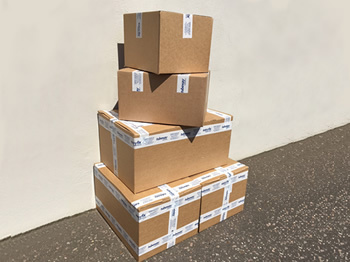 Given our factory and offices are in Ipswich, Suffolk, this makes delivery to England, Wales and Industrial Scotland straightforward, with the largest range of quick and deadline deliveries. Scottish Highlands and Northern Ireland are further and can be harder to reach, so there is a reduction in quick services and a jump in cost, with UK islands being the most remote, which is also reflected in the services available. The quickest deliveries to mainland locations will be next day, next day pre-noon or 10:30, and Saturday deliveries are an option. For Highlands and Northern Ireland, the standard services are more likely to be 3-4 days, while UK Islands are typically 5-7 days. Some of our customers collect from our premises, which can usually be arranged with prior discussion. Other than this, we operate flat rate (usually subsidised) standard services, with enhanced services being charged to you at cost. For details and a quote for any service, please contact our sales team who will be pleased to help you.